SUP can be a great tool to heal the mind and body. Any paddler will tell you this, and now if you live in the French oceanside town of Biarritz, a doctor might tell you too. The doctor’s of Biarritz have become the world’s first to prescribe stand up paddle and surfing lessons to treat everything from depression to heart disease. Twenty doctors are participating in a new project to encourage the French to reduce the pill-popping and take to the water instead. Henry Samuel, from The Telegraph, reports that doctors are authorized to prescribe a 12-week course in sports, including surfing or paddleboarding as well as activities like nordic walking or swimming. Samuel reports that in some cases the 12-week prescription replaces all medication. The pilot program was created by the national Olympic committee and does not cost the French social security system a dime. Instead, the program is paid for by the town of Biarritz and two private health associations. 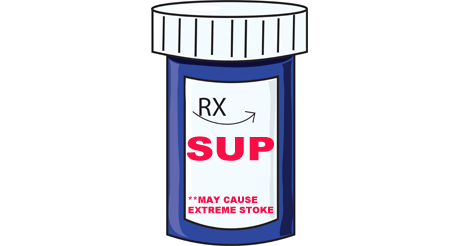 Imagine the costs that a large health care system like the United States might save by prescribing SUP instead of expensive pills. Sounds like an easy pill to swallow! “After six months, the results are already positive in our eyes,” Nicolas Guillet of Biarritz Sport Sante, one of the organisers, told Nouvel Observateur. The Telegraph reports that nearly all patients who complete the 12-week program go on to continue practicing the sport. One patient who was prescribed stand up paddle sessions for low back pain said: “I’ve suffered from back pain for so long. I had an operation 10 years ago and was even paralysed for over a month,” she told Nouvel Obs. Six months later, she said her back pain has almost disappeared, describing it as “a revolution”. It would be great to see other countries implement similar programs as the French. The United States could certainly use something like this. According to drugabuse.gov, the United States has 5 percent of the world’s population and consumes 75 percent of the world’s prescription drugs. There is no better time for US doctors to start prescribing paddling instead of pills. If you are a paddler then you already know the health benefits of SUP first-hand. Now patients in France, and maybe one day around the world, will feel the benefits of SUP without the side-effects of prescription medications. It’s great to see this initiative at a public health level. Read the full report on the program in France here.